The best relief for Dog's eyes. It is spring allergy season. And our allergies are raging this year. I'm struggling. And poor Willy, my dog, is struggling. This is always a rough time of year for him. Fortunately, I have found something that helps alleviate his eye irritation. Vetericyn products are recommended by farmers and homesteaders as a brand that is reliable for the treatment of their livestock and pets. 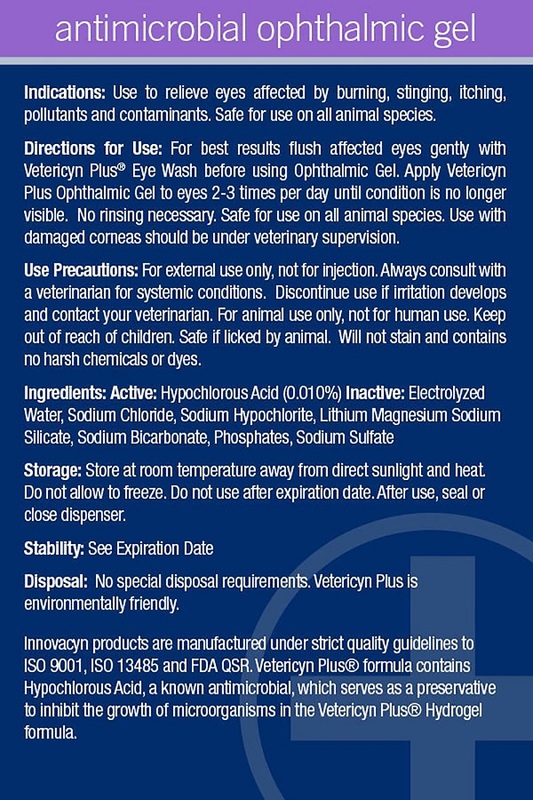 It was from these recommendations that I learned about Vetericyn Antimicrobial Ophthalmic Gel. Willy has very sensitive skin. Every year we struggle with his allergies. He looks like he has mange, we go to the vet and get him tested, and we learn that it's allergies. Willy gets itchy and scratches until he loses patches of hair. Shampoos and creams alleviate some of the body itching. However, his eyes are often extra sensitive. When his eyes are itchy, he ends up rubbing the hair off from around his eyes. It is very difficult to treat a pet in areas near their eyes. The creams and shampoos that provide the most itch-relief are usually not safe for use near their eyes. The prescription eye cream from the vet is the only other thing that is safe for use on and in the eyes - and it is expensive and comes in a very small tube. It runs out very quickly. Because of his allergies, and my frequent rubbing him down with something-or-other, Willy hates for me to approach him with any cream, spray, or gel. Hates it. I have to follow him to catch him. I typically take him to the bathroom to decrease the chance of his escape before I am able to administer whatever it is I have to administer. But, when he sees me with this little blue bottle he dances around and whines. He wants to avoid me and yet he wants the relief in his eye. It's easy to see by the way he dances around, finally approaching me with his head down, that the Vetericyn provides relief. I keep Vetericyn eye gel on hand for poor Willy's itchy eyes. But even if his allergies end some day (fingers crossed that day comes), I will always keep a bottle on hand for as long as I have pets. Vetericyn is a brand I've come to trust.